What percent of corner kicks turn into goals? I have looked around for this statistic without luck. I just wondered what percentage of corner kicks actually result in a goal? Not necessarily straight in, but from the same passage of play. I have seen answers (without any references) varying from 2.5% (feels too low) to 32% (surely way too high). Anyone know? but generally the ratio of corners to goals is almost zero. You can see that Fulham who has the best ratio has 0.07 goals for corner. You might be surprised to hear that the ratio of corners to goals is almost nil. On average, the data show that a corner is good for (drumroll ....) 0.022 goals. This means that the average EPL team scores 1 goal from a corner about every 10 games. 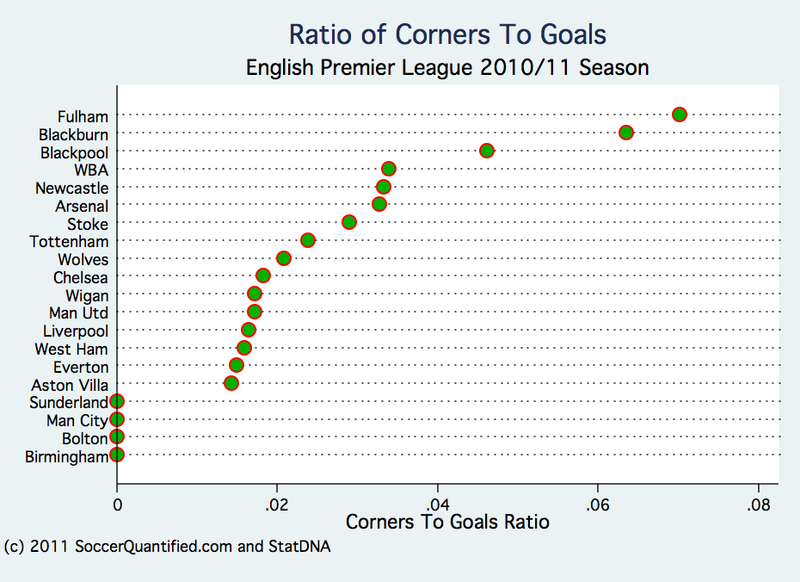 And this helps to explain the lack of a correlation between the number of corners and goal scoring. The infrequency of the goals from corners combined with a lack of dispersion between teams in corners per game lead conspire to make corners mostly, well, useless when it comes to scoring goals. In this sample of matches, Fulham and Arsenal led the league in converting corner-created shots into goals at a rate of over .25, while at the low end, none of the shots created by Sunderland, Man City, Bolton, or Birmingham found the net. Copyright notice: The images and quotes posted above remain the sole property of the original owners and are posted here for educational purposes only. The chance that a goal will be scored off a corner kick appears to be roughly 3%. Only 17 percent (2,157) "produced a legitimate shot attempt." Of those shot attempts, 370 were scores. Caley links to a study by Chris Anderson and David Sally at Soccer by the Numbers, which showed that EPL teams converted corners between 0-7% during the 2010/11 season, with the average team converting corners into goals at 2.2%. At that rate, the average team would score by corner kick about every 10 games. Not the answer you're looking for? Browse other questions tagged football statistics or ask your own question. What percentage of football goals originate from corner kicks? Is it possible to shoot from a corner so that the ball directly goes into the goal without being hit by other players? Who is the best striker (best goals/appearances ratio) with 25/50/100+ national caps? What will happen if a corner flag blocks the football rolling out of bounds? What percentage of onside kicks have been successful in the 2015 NFL regular season? How are stoppage time goals deduplicated from regulation time goals?